Thousands years after Macedonians, the conquerors of Multan present an amazing variety of races: Graeco-Bactrians are followed by the Kushans who in turn give place to White Hans. The Arab first arrived here in 662 A.D. and it came under Muslims rule in around 712. Multan also remained under Karmatians, Lodhis, and Ghaznivids. Between 1221 and 1528, ten invaders swept through the city till it finally fell in the hands of Mughals in 1528. Under the Mughal rulers, Multan enjoyed years of peace and prosperity. Nawab Muzzafar Khan remained in power from 1779 to 1818, when Ranjit Sing stormed the city. After a resolute defense, British captured Multan on 22 January 1849. From Alexander to Aurangzeb the city was built, damaged, repaired, destroyed, demolished, and reconstructed many times. After the British rule, partition once again changed the face of the city and it witnessed the new demographic and socio-economic order in 1947. Multan has been reinventing itself ever since. Today, there are 'two' Multans. One is the city of inordinate glory and unique architectural style: imposing citadel, Agha Khan International Architecture Award winner Shrine of Saint Shah Rukn-i-Alam and shrines of Bahawal Haq Zikaryya, Shah Yousaf Gardezi (also other shrines of religious, architectural, and historic values) and landmarks like the newly constructed building of State Bank of Pakistan. It is a city of calligraphers, writers, poets, actors and actresses who make difference in the lives and outlooks of others. The other Multan is a soot-choked city (spread over 28 square kilometers area) developed haphazardly without any planning and foresight. This is a city where old trees are ruthlessly cut and all the open spaces have been converted in jungle of concrete in the last 55 years. The walled city - one of the living examples of old Muslim urbanization in the world - is crumbling. Refuse is everywhere, the air thick with flies. Electric connections are loose and dangerous wires are hanging about. The narrow streets are dark at night. As you roam about in the old city called androon shehr, you will see aged palace-like havellies, shrines, remains of defensive walls, historic gateways, and mosques in the most unexpected places. That is Multan's charm. 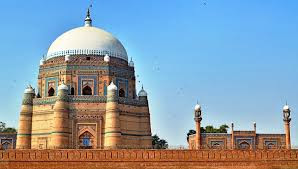 There are probably more heritage sites in Multan than in all of Pakistan, which is why this city should be recognized by UNESCO as a "World City of Heritage". Three severing historic gates (Haram, Delhi, and Bohar gates), Hussain Agahi entrance, Khooni Burg (bloody tower), remains of the wall, and Alang (ring road) around the medieval Old City are crowded with stalls and cubbyhole shops and rehriwalas. As per an estimate, there are about 40,000 venders working in every nook and corner of the city selling every thing from Nali Nihari to new carpets. Clay pot made in Multan Keeping part of its historical and cultural heritage in tact, Multan has accepted the modern trends. People still like to eat Doli Roti, Daal Mong served on tree leaves, specially cooked Sohanjna (curry) and Tabakhi ke Bor (curry). Word is out and it says that a food street (like Gawalmandi in Lahore) is being planned near Hussain Agahi where conventional Multani food will be served. Needlework on Dopatta (head scarf for women), golden work on Khussa (sandals), and items made of clay and camel skins and Sohan Halwa are very popular. At the same time the blue pottery, glazed tiles, cotton sheets, bed spreads, and towels of Multan are in great demand in Pakistan and abroad. Historian Al Masudi wrote, "Multan is a gold mine" and Dr. Karim Dad says, "Multan is a cotton mine with 35,000 power looms manufacturing exported cotton goods." Gard, Garma, Gada and Goristan are no longer the gifts of Multan. The last thing on the minds of city planners is preservation of Multan's old and legendary heritage. Historic buildings disappear without regret and even the protected monuments are suffering from vandalism. Only 24 historic monuments have protected status in the city. Whereas at least 131 sites of intrinsic and irreplaceable value have been recommended to be protected by Gilmore Hanket Kirke Limited, London based architects, engineers and planning consultants firm who carried out a survey of the city, in cooperation with the World Bank, a decade ago. The list does not include historic houses, narrow streets and engraved 'jarokee' and bay windows - being eaten by termites - inside the walled city that are a vital and living part of present Multan. Multan building The services of the Corporation and other city development agencies are barely visible in the city. Multan Development Authority, since inception, has hardly been able to do any thing evident in 362 square kilometers area of jurisdiction. A cricket stadium with seating capacity of 18,000 built in Qasim Bagh, 50 feet above city level, was declared unfit for international cricket in 1984 and construction of the stadium inside the cluster of historic monuments, shrines of Shah Rukn-e-Alam, Bahawal Haq Zakaria and Nawab Muzzafar Khan, memorial Obelisk, Barood Kana, Damdama, and Babe Qasim, has been a classic example of ignorance of city planners about our heritage conservation. During the last days of Tughlaqs, when the whole of their empire was in pieces, Multanis selected Shah Yousaf Gardezi, a religious leader and a saint, to run the affairs of the city. If nothing else, the governance of the city should be improved for the saint's sake whose shrine - a unique specimen of architecture - is venerated by many in the Old City. Multan is rich in both history and archaeology that make for good tourism. In this age when the word tourism is top most industry, Multan could still be a tourist's paradise. The mall road in the cantonment could be extended to the other (Fertilizer Factory) end of city through Airport, Sadar, Abdali Road, Haleem Square, Khanewal Road, touching Bahaudin Zikria University, Qila Kohna and walled city on the way. The encroachments and other bottlenecks could be removed from the road. "It should be called Nawab Muzaffar Khan Road after the name of a lieutenant of Liberty from Multan," says Professor Atta Ur Rehman Khan. Not withstanding the aforesaid and other typical misdemeanors, I shall still adore preserving the gard (dust) of Multan with Sraiki speaking, passionate and full of love Multanis. Wow, the mosaics on that building is gorgeous. I believe in having some place to love. It keeps us going, knowing that we have a place to embrace at the end of the day. A lovely place indeed :) And where can I get a copy of your book? Irving Karchmar: This is in Urdu. Email me your street address and I will send you the book. Multan is among the oldest living cities of subcontinent presumably as old as Harrapa.